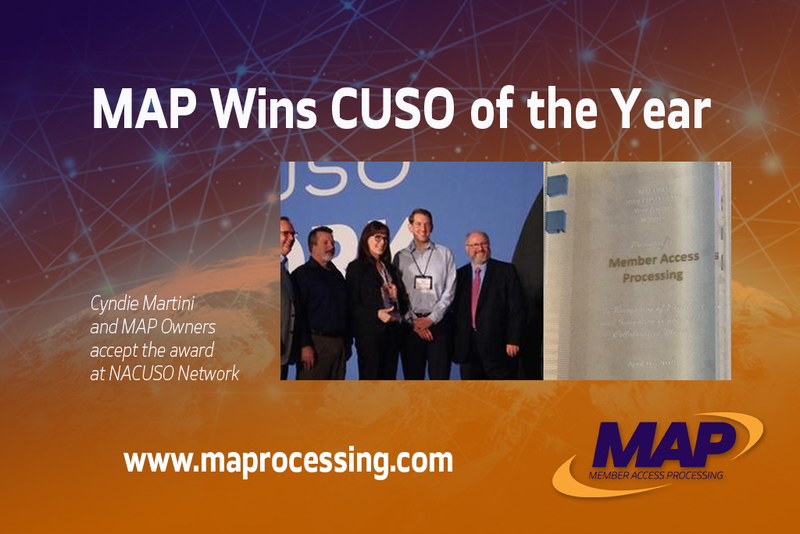 We are thrilled to share that Member Access Processing (MAP) is the recipient of the 2019 NACUSO Credit Union Service Organization (CUSO) of the Year Award. MAP's President and CEO, Cyndie Martini, was in attendance to celebrate receiving the award on Tuesday, April 16, during The 2019 NACUSO Network Conference in San Diego. Every year, NACUSO sets out to recognize outstanding CUSOs and one credit union with multiple awards, including CUSO of the Year. Award winners are determined by a panel of industry leaders and experts who carefully examine nominees. The CUSO of the Year award is given to a business who separates itself from the rest by providing consistent value to its credit union partners with an effective collaborative model. As the nation’s largest aggregator of card services for credit unions, Member Access Processing has been a stable and trusted card-processing services partner for the country's largest and smallest credit unions for more than 20 years. With quality service at its core, MAP provides its client credit unions the unique opportunity to leverage the Technology, Security, and Service of Visa for their members.